Let's Dance ... Wait, What? So, I listen to Glenn Beck. Big surprise, right? Anyway this past week he was talking about how during the big rise of the Progressive era there were also anarchists and somehow these two groups found each other. But, why? I mean if you think of the American political spectrum these two groups would be very opposite of each other, with the farthest left being tyranny (total government) and the farthest right being anarchy (no government). I'll discuss the why's a little bit more after I discuss the fact that it did indeed happen. When I was listening to Glenn all of a sudden I had a memory pop into my head. My talented cousin was in several musicals and plays while in high school: one of them was entitled Tintypes — set during the early 20th Century. She played the part of Emma Goldman, a famous anarchist at the time. At one point her character and the character of Teddy Roosevelt engage in a heated discussion and then they break into this bizarre love-song and dance. It was quite a funny scene, but when it popped back into my head recently I had the sudden and shocking realization that it actually was a metaphor for what really did happen. Yes, these two opposing sides joined up, in some kind of bizarre dancing fiasco. 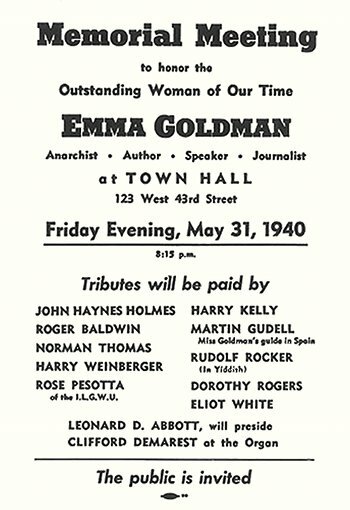 Let me tell you a little about Emma Goldman (1869-1940). She was Russian born and emigrated to the US in 1885. In New York she began to be interested in the anarchist movement. She eventually became a kind of spokesperson and writer for the cause. Goldman's brand of anarchy differed from the traditional no-government type in that it required revolution, it was radical. Though she decried some types of violence, she and her lover Alexander Berkman planned an assassination at one point in order to further their agenda. She worked to inspire others to rise up for a revolution. And she was willing to join with those who should have been on opposite sides. I happened upon this interesting document. After Ms. Goldman's passing a memorial service was held in New York. I took the time to do a little research on some of those who spoke. Here's a quick rundown of some of the peeps. John Haynes Holmes, Unitarian minister (note that Emma Goldman was not exactly a fan of religion), pacifist, anti-war activist. He helped found the ACLU. Roger Baldwin, one of the founders of the ACLU. Some of the ACLU's landmark cases took place under his direction: Scopes, Sacco and Vanzetti, and the challenge to the ban of James Joyce Ulysses (Joyce as in the Joyce foundation? hmmmm). He was a one-time Communist, though he later denounced Communism, but continued work in the ACLU. Jimmy Carter awarded him a Medal of Freedom. Norman Thomas was a 6-time presidential candidate (that's cool) for the Socialist Party of America (doh!). He championed Progressive causes. Rose Pesotta was an anarchist and feminist labor organizer. Harry Kelly was another anarchist and a lifelong activist in the Modern School movement. Dorothy Rogers, an early civil rights activist (now honestly I do think that's cool), and a staunch defender of FDR's New Deal (dang it). Leonard Abbot: he presided :), radical thinker, socialist, also into the Modern School thing. Martin Gudell was Emma's guide while she was in Spain, he worked with the propaganda department of the CNT-FAI's (nice). Rudolf Rocker, an anarchist without adjectives. (I think that means whatever the heck he wants it to mean.) He was active in the Social Democratic Party (SPD). He was part of a wing called Die Jungen (The Young Ones), who were unwilling to wait for the predicted collapse of the capitalist society (that was Marx's prediction), and instead wanted to bring it about by revolution. So, yes, Emma Goldman and other anarchists mixed with Socialists, Communists and Progressives. But, why? Why would opposites attract? They are on the opposite side of the horizontal political spectrum. But if you add a vertical one you might see why. For this you get to see my amazing handwriting that a friend once described as 13-year-old-boy handwriting. Well, they let her dance. Check out this scene from the Broadway presentation of Tintypes. So, why bring this up? Well, the reason we study history is to learn from it. Right now there are radicals among us. In fact a lot of them are in the government. There are Progressives, there are Socialists, there are Communists out there being influential. 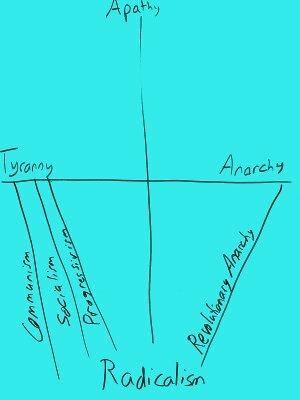 There are likely anarchists too. And I'm quite certain they are willing to unite in order to bring America down so that they can than fight over the scraps. We must be mindful and watchful and realize their agenda. On that spectrum right in the middle of the horizontal spectrum is where the founders placed The Constitution. On the vertical spectrum we ought to be right in the middle too, appropriately active and knowledgeable about civics and the need we have to be involved. That is the best check against the downfall of this nation.